Built in 1887 and the oldest High School in Polk County, preservation is important to the Polk County School District and the school officials at historic Bartow High School. Due to the leaks in the old gas piping, their science labs have had the leaking gas pipes shut off in these facilities for many years. Replacing all the black iron piping would mean tearing up walls and floors. Instead, Polk County School Officials once again chose the neater, cleaner, and non destructive ePIPE® System from Florida Pipe-Lining Solutions. Holder of 8 Patents, the unique ePIPE ® barrier coating system restored the pipes to a like-new condition without the destructive remodeling mess associated with re-piping. The Senior Project Engineer from FPS surveyed all the gas piping in the science labs and then planned a complete ePIPE® restoration of the old piping. Providing our clients with the highest quality service, workmanship and safety is always our #1 mission. In addition to being Florida’s Leader in pipe restoration, FPS is also an approved State of Florida School District Contractor, meeting the strict screening standards of section 1012.467 of the Florida Statue. All FPS Technicians have this Security Clearance. Once the Bartow High School project commenced, the Technicians securely closed off and tagged the gas supply, then used compressed air and sand to clean and remove years of rusty scale from the inside of the old piping. After the cleaning, they installed the ePIPE® epoxy barrier coating to the inside of the gas piping and installed the new shut-off valves. The ePIPE ® coating provides a durable porcelain like finish that prevents rust and leaks from returning. After the piping was cured, the newly restored piping was put back on line and the entire system tested and put back into service. The cycle of corrosion was broken. The interior of their piping was now smooth, corrosion-free, and warranted not to leak for years to come. In a period of 4 weeks the decades old gas piping was brought back to life. No more leaks and the ePIPE® epoxy lined gas piping meant that students could now safely use their Bunsen burners. 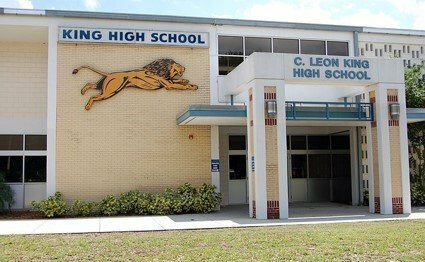 The Hillsborough School District and the school officials at King High School in Tampa were plagued by rusty water in the aging water piping of this early 1960’s era campus. They could have all the water pipes replaced. That would mean tearing out walls and floors to re-pipe. Instead, Hillsborough School Officials did their research and chose the neater, cleaner, and non-destructive ePIPE® System from Florida Pipe-Lining Solutions. This unique and Patented epoxy barrier coating system restores the pipes to a like-new condition without the destruction, mess, and remodeling associated with re-piping. The Senior Project Engineer from FPS first surveyed all the piping in the buildings at King High School, then planned a complete restoration of the existing galvanized and copper water piping. As Florida’s Leader in pipe restoration, providing our clients the highest quality service, workmanship and safety is our mission. All FPS Technicians have the Jessica Lunsford Certification and Level 2 Security Clearance. Once the King High School project commenced, the ePIPE® Technicians shut off the water supply, then used compressed air to clean and remove years of rusty scale from the inside of the old piping. Then they installed the NSF approved ePIPE® epoxy barrier coating to the inside of the water piping providing a durable porcelain like finish that prevents rust and leaks from returning, and stops lead from leaching into the schools water. After the piping was cured, the newly restored piping was put back on line and the entire system tested and put back into service. The cycle of corrosion was broken. The ePIPE® epoxy lined water pipes meant that water no longer touches the metal of the school’s old pipes. The interior of their old piping was now smooth, corrosion-free, and warranted not to leak for years to come. In a period of 10 weeks the decades old piping of the 5 buildings was brought back to life. No more rust, leaks, or dangerous lead leaching into the students’ water. So impressed were the school officials seeing the dedication and diligence shown by the ePIPE® crew working on the King High School restoration as well as the finished project, Hillsborough County School District scheduled Florida Pipe-Lining Solutions to begin restoration of the Hillsborough School District Headquarters (ROSSAC Building) in downtown Tampa. 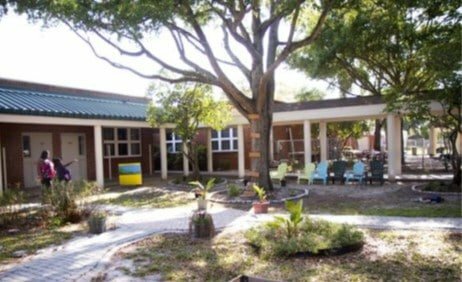 “In partnership with home and community, Sikes Elementary is committed to educating productive citizens of tomorrow.” That is the Vision Statement that this South Lakeland Elementary School’s 900 students and Faculty live by. After doing their research and looking at their options, Polk County School officials chose the non-destructive ePIPE® System from Florida Pipe-Lining Solutions. Holder of 8 Patents, this unique epoxy barrier coating system restores water pipes to a like-new condition without the destruction, mess, and remodeling associated with re-piping. The Senior Project Engineer from FPS surveyed the failing bathroom piping and planned the restoration. As Florida’s Leader in pipe restoration, FPS provides our clients the highest quality service, workmanship and safety in the industry. All FPS Technicians have the Jessica Lunsford Certification with Level 2 Security Clearance. Senior Restoration Tech, John Richards was Project Supervisor on the Sikes School project. John and his crew shut off the water supply, then used heated compressed air to clean the inside of the old piping. Then they installed the NSF approved ePIPE® epoxy barrier coating to the inside of the water piping, providing a durable porcelain like finish that prevents leaks from returning, and stops lead from leaching into the water. After the epoxy lining was cured, the newly restored water piping was pressure tested and the entire system being serviced was put back on line. Working over Spring Break to minimize any disruption to school facilities, Techs from Florida Pipe-Lining Solutions were able to bring the old copper piping back to life. 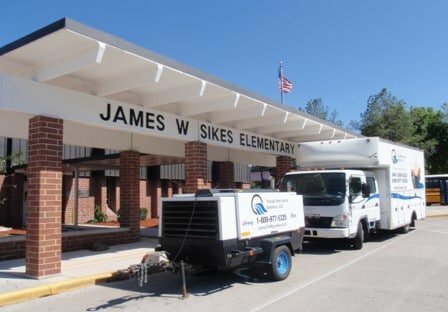 No more leaks or dangerous lead leaching into the students’ water and by using the proven ePIPE® System, the Polk County School District saved time and money. 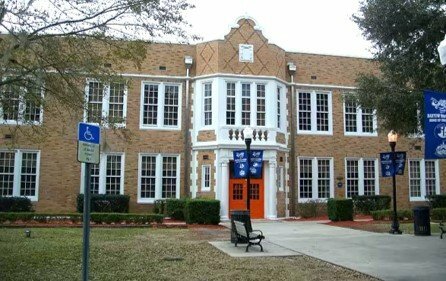 The Hillsborough School District and the school officials at Sulphur Springs Elementary in Tampa were plagued by leaks and low pressure in the aging water piping of this historic campus. Replacing all the water piping would mean tearing out walls and floors. Instead, Hillsborough School Officials once again chose the neater, cleaner, and nondestructive ePIPE® System from Florida Pipe-Lining Solutions. This unique and Patented epoxy barrier coating system restored the galvanized and copper pipes to a like-new condition without the destruction, mess, and remodeling associated with re-piping. The Senior Project Engineer from FPS first surveyed all the piping in the 7 buildings and then planned a complete ePIPE® restoration of the existing galvanized and copper water piping. As Florida’s Leader in pipe restoration, providing our clients with the highest quality service, workmanship and safety is our mission. All FPS Technicians have the Jessica Lunsford Certification with Level 2 Security Clearance. Once the Sulphur Springs project commenced, the ePIPE® Technicians shut off the water supply, then used compressed air to clean and remove years of rusty scale from the inside of the old piping. After the cleaning, they installed the ePIPE® epoxy barrier coating to the inside of the water piping. Holder of 8 Patents, the ePIPE® coating provides a durable porcelain like finish that prevents rust and leaks from returning, and also reduces lead from leaching into the schools water. After the piping was cured, the newly restored piping was put back on line and the entire system tested and put back into service. The cycle of corrosion was broken. The pressure was back and the ePIPE® epoxy lined water pipes meant that water no longer touches the metal of the school’s pipes. The interior of their piping was now smooth, corrosion-free, and warranted not to leak for years to come. In a period of 10 weeks the decades old piping of the 7 buildings was brought back to life. No more leaks, or low water pressure.